It's surprising how much air can weight, I thought as I stumbled, heavily laden from stores to the bus. Jarv had very kindly left quite a few gas cylinders for us to practice weightlifting with, and I certainly enjoyed the challenge. With three seats in the bus reserved for a decade of accumulated junk, we were fortunate not to need space for any SRT gear in the Mendips. It was a relatively short drive over top the SMCC hut, made more pleasant by Spaniel's excellent music collection and more lively by Saber's approach to driving in fog. Tanguy cooked up a huge amount of pasta (we had about twenty people to feed!) complete with a cream, mustard and cheddar sauce, and we got down to the serious business of enjoying ourselves for the evening. 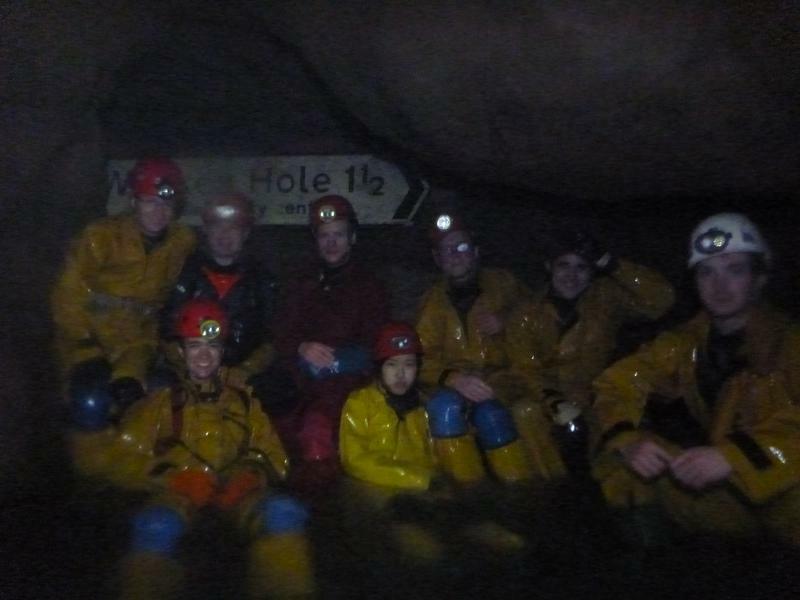 The next day we rose and were told there was really only one option for which cave to go down - Swildon's Hole, as with every ICCC trip to the Mendips. Later on I found that my parents had been through that very cave years before I was born (Mum was apparently deeply traumatised by Sump 1) but at the time I had no idea of any connections to the cave. Tetley rounded up some 'keen freshers' to go bail the ducks out, and Rhys struggled to get the less keen into their gear and ready to head over. Eventually we got going and strode across the fields to the small concrete hut squatting over the entrance. We scrambled down through a fast, cold waterfall, and briefly considered climbing down a rock face before taking the safer, but far wetter, route through the stream. The streamway meandered down through several nice pools to the first big waterfall, which someone had kindly rigged with a handline. Shortly afterwards we came to the top of the ladder pitch, where we waited for several other groups to go up and down - Swildon's is obviously popular. I'd never done a ladder before, so I was bit surprised by how much it twisted, and how much it hurt when your fingers get stuck between the rungs and the rock face. At the bottom we quickly got moving again, and soon found a way up and out of the streamway, towards where we thought the ducks were. After a fair bit of searching we couldn't find a way on down that passage, blocked as it was by seemingly impassable sumps with old warning signs about foul air. We doubled back and re-entered the streamway, and shortly reached sump 1. Sumps were again new to me, and those few seconds underwater certainly weren't pleasant. James showed us what he's really made of by staying underwater for several meters clear of the sump, presumably unaware that he could surface. We stopped for a group photo near the road sign for Wookey Hole, and then rounded the corner and met Tetley's gang. Pete and Oli decided to head out of the cave with Tetley, so we scrambled up the handline to check out some ducks and the Birthday squeeze. I flooded my nose in the ducks and felt like I almost got stuck in the squeeze, but it was a nice way to round off the trip before turning back. We made it out without any major incidents - I thought the sump was worse on the way back through, and we needed to use the rope to assist some people up the ladder. We picked up a straggler from another caving club who decided to quit his trip and leave the cave with us. On the walk back to the hut we followed the glowing red lights of the radio mast, piercing through the fog like some poorly placed lighthouse. Back at the hut, James and Rhys took part in a competitive cheese grating contest whilst a huge chilli was cooked. The evening quickly descended into caving games. The next day there was not much enthusiasm for caving - it was foggy and raining quite hard, but we'd deliberately left the ladder in Swildon's with the intent of running another trip there on Sunday. Rhys collected up a small team to go retrieve it, including Spaniel, who'd never caved before. The water was definitely flowing faster than on Saturday, and this time there was no handline down the first waterfall. Still, we can't have been more than an hour or so in the cave before we emerged into the rain and wind again. We decided to go check out Eastwater and see whether it was worth heading down, but when we got there we realised the was just too much water pouring in to make it a good idea - we slumped back to hut, cleaned up and then headed back to London - at least we got some caving in!